Every year the Notre Dame Titans’ football team and cheerleaders host Rough Rider night during one of their home games at historic Spartan Stadium. This is a night where the Titans are able to recognize their affiliated youth program, the Rough Riders, while giving the young athletes a glimpse of future Friday night football and cheerleading in the SOC I. For the 2017 football year, that night was Sept. 15th. 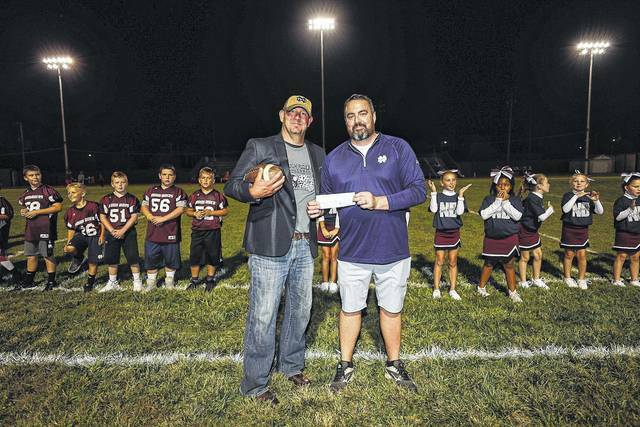 Pictured is Rough Riders’ President Steve Barbarits who presented new Notre Dame Elementary School Principal, Josh McMackin, with a check for $2,500.